Editor’s note: Shabana, 23, is an illiterate housewife and mother of six children. Jalalabad — Gender difference in a family means treating boys and girls differently. It is common in an Afghan family to keep girls at home and let boys go outside and go to school. In our family, girls stay home. Girls cannot select even their own clothing. My husband believes that people will laugh at us if we let our girls go outside. He says there is no need for girls to go and study because they will only marry and it is her husband’s responsibility to feed her. One bad memory is the day we had no water inside and I was not allowed to go outside because my husband did not like if I left the house. All that day until evening I waited at home until he brought water. It hurts me that I had no freedom when I was a girl, and now when I am a mother I still have no freedom. There are two reasons we have no freedom. The bad security in our province and also because of the culture. I remember when I was getting married. No one asked me if I was happy. They asked my brothers if they were happy because my brothers were the ones who held my rights. I was thirteen when my husband brought me to his house, he hit me over small things that could be solved by talking about them. Then he married a second wife. So mostly now he spends time with her and leaves me alone with my children. To stop and prevent this discrimination, first the government must be responsible and take steps against it and then we all should start in our own families, even when it is not easy. We should be brave. We should talk with neighbors and relatives about it so they can talk with their husbands. Daughters should be allowed to speak and defend their rights. Brothers cannot take the place of fathers. It will continue like this until we take our rights. 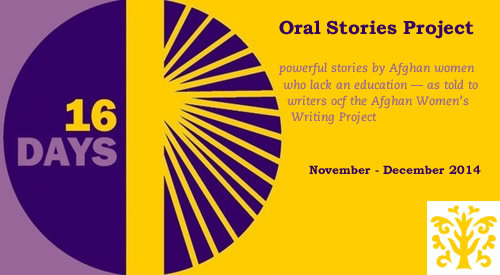 Shabana was interviewed for AWWP’s Oral Stories Project as part of our participation in the Sixteen Days of Activism Against Gender Violence Campaign.